The University of Georgia’s newest bermudagrass release will be under the microscope during the 69th annual Southeastern Turfgrass Conference set for Tuesday, April 28 at the UGA Tifton Campus Conference Center. The turfgrass conference will begin at 8:15 a.m. and will conclude at 4:15 p.m. Turfgrass researchers from various colleges and universities, including the University of Tennessee, Mississippi State University and Abraham Baldwin Agricultural College, will present their studies and findings. 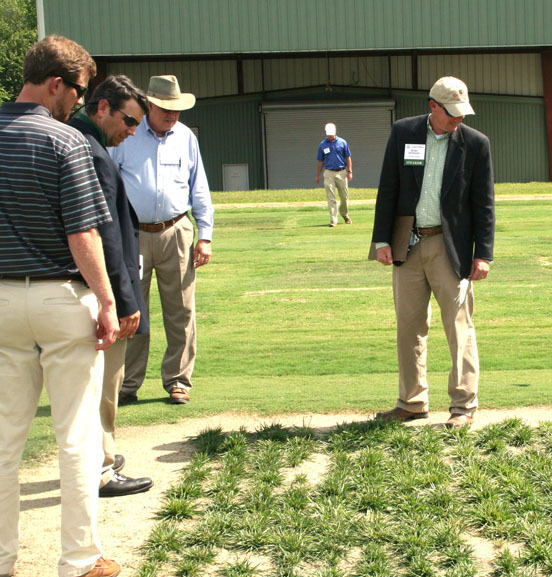 The conference will also include a tour of UGA Tifton’s turfgrass research plots. UGA’s DT-1 turfgrass variety will be released this year by the UGA College of Agricultural and Environmental Sciences’ turfgrass program. First studied in 1992 by then-turfgrass breeder Wayne Hanna, DT-1 has proven to be drought- and wear-tolerant through more than two decades of research. UGA Tifton turfgrass breeder, and Hanna’s successor, Brian Schwartz is excited about releasing DT-1 and providing its advantages to homeowners and golf course superintendents. DT-1 excels in Georgia research trials and has also performed well in the western portion of the South, particularly in Texas and Oklahoma, where drought is a major concern. During this year’s turf conference, Schwartz will discuss management requirements and herbicides that can be safely applied while growing DT-1. Consumers will like that the grass performs well solely with water from Georgia’s typical rainfall patterns, Schwartz said. “When I leave work, I’m just the average homeowner. I really don’t want to water. I really don’t want to mow that much. If my lawn’s looking decent, I’m happy,” he said. Finding grasses tolerant to little or no water has been a priority for Schwartz since he arrived at UGA Tifton in 2009. He already has high hopes for future turfgrass variety releases. “I’m already seeing grasses on the horizon that are better than these new ones, but they need another 10 years of research to make sure they don’t have other problems,” Schwartz said.